Halo 5 is the second installment of the 343 Industries-developed by Halo trilogy, and expectations undoubtedly ran high leading up to its release with it being the first Xbox One-developed Halo title (the Master Chief Collection notwithstanding). It should come as no surprise that it is the biggest launch in the franchise’s long history. So if you’re one of the few who have yet to take the plunge, read on to find out what you’re missing. If you’re going into this game expecting a strong story, you’ll be sorely disappointed. There’s nothing compelling about the narrative, and all the build up falls flat by the time you get to the ending, which leaves you on a frustrating cliffhanger. And while Master Chief has been the lead throughout the series, he takes a backseat here. Spartan Jameson Locke, who shares the cover with the Master Chief, is the main character in this game. You spend the majority of the game playing as Locke, with only a few missions sprinkled in as Master Chief. But don’t let that hold you back from playing through the campaign. Regardless of the missteps of the story, each level is thoughtfully crafted, and they’re all enjoyable to play. Plus, with the campaign offering four-player co-op, it makes for an intriguing experience to play with your friends. Unfortunately, you cannot play split-screen locally with a friend, which is a shame. Graphically, Halo 5 isn’t anything ground breaking. It looks great, but it certainly wouldn’t win any awards for the best-looking game on the market. However, running at 1080p and 60 frames per second, Halo 5 is the smoothest experience of all the games in the series, and there are some truly spectacular set pieces. Perhaps the best upgrade to Halo 5 is the improvements to movement. It’s more fluid and is very easy to pick up and learn, whether you’re a veteran of the series or a first-timer. Sprinting is now unlimited, and you even have the ability to clamber up ledges. Plus, you can use your thruster pack to quickly boost yourself in any direction, which can come in handy if you’re in a bind. These sound like small additions, but they have a noticeable impact on gameplay. You’re also given a new set of melee attacks to use: the shoulder charge and the ground-and-pound. Both of these attacks are among the most satisfying ways to take an enemy down, and they add another dimension to close quarters combat. The shoulder charge helps you quickly close the distance on your target and it packs a huge punch. It can kill some enemies in one shot, and you’ll ragdoll most things you make contact with. The ground-and-pound is more tricky to successfully pull off since you’ll have to be above someone and there’s a short charging period before you’re able to pull it off, so lining one up against a fast-moving target is not easy. But it’s an area-of-effect attack that can take down multiple enemies in one shot, and there’s no better feeling than taking down several unsuspecting targets from above at once. You can tell that that developers really took the time to balance out the weapons, and you’ll find yourself picking up and using weapons that you may have hated in Halo 4. Another new feature is the ability to aim down the sights of every weapon in the game, which is a change from previous iterations. Also, if you’re mid-air and aim down your sights, you hover briefly in the air as you line up your shot. The trade off is that you’re exposed mid-air with no cover, but it’s a great new feature that can have a major impact on gameplay. Overall, the squad AI is passable.You can usually leave them be and expect them to offer you enough support. For instance, when you jump in the driver’s seat of a Warthog, one of your squad mates will man the turret while you drive. However, if you get downed and need to be revived, things get a little messy. Expect to see at least one or all of your squad mates get killed as they run to revive you with little regard for their surroundings. Squad commands are basic and seem to work well enough. You can order them to take certain positions, pick up weapons or attack specific targets. However, it seems as if the game was made to be played with three other friends at your side. Arguably the largest draw for any Halo game is the multiplayer, and the game really shines here. From the classic Slayer mode to the new Warzone, 343 really nailed the multiplayer experience. It has everything that you loved about multiplayer from previous Halo games and adds another layer of polish with the new game mechanics. Warzone, in particular, stands head and shoulders above the rest. It’s a huge team battle that pits two teams against each other as they vie to control different points on the map. Once a team controls all the capture points, it exposes the opposing team’s core to being destroyed. As you play the game, you unlock requisition packs, which reward you with different weapons, abilities or vehicles to use at various times throughout each match. You can get a quick advantage by blowing your requisition on a better weapon early on in the match, or you can wait and get a tank later on, which can be a game-changer in the heat of battle. 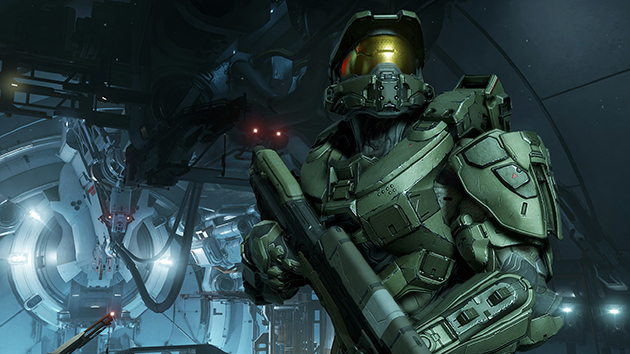 If you’re a big Halo fan, chances are you already bought Halo 5. But if you’re on the fence about getting it, think no more. In terms of sheer gameplay, Halo 5 is hands down the best in the series. The combat in Halo 5 is better than ever, and the multiplayer experience is unrivaled throughout the series’ long history. Warzone is one of the best multiplayer modes of any shooter out there, and that alone will keep you playing for months on end.